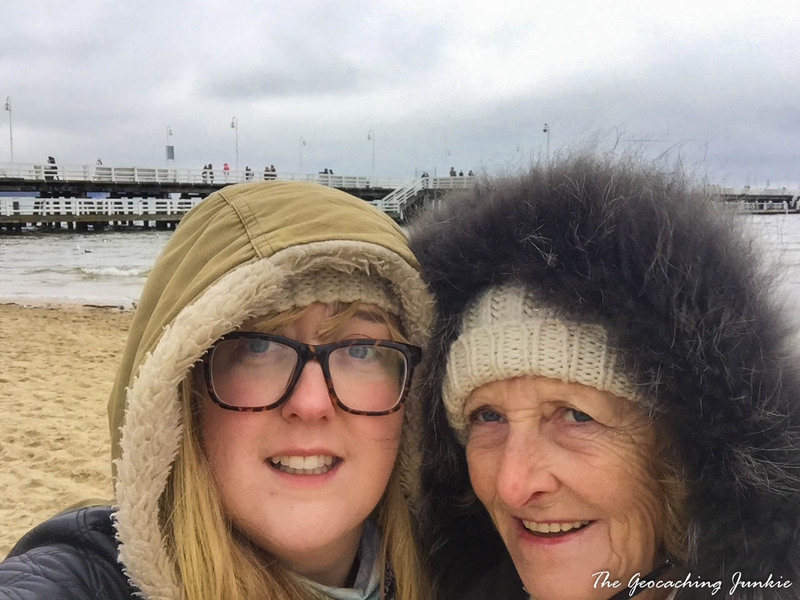 While on our recent trip to Gdańsk, the mother and I decided to catch a train to the seaside resort of Sopot, located between Gdańsk and Gdynia, the three cities together making up the ‘Tri-City‘ (or Tricity). 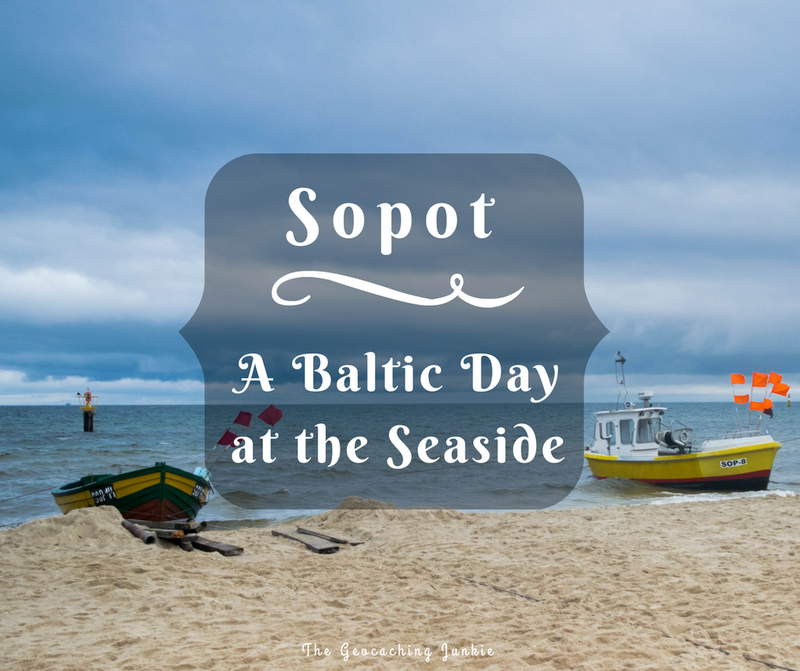 The trains run regularly (approximately every 15 minutes), taking just 20 minutes to get to Sopot from Gdańsk main station and the journey costs just a few Euro for a return ticket, so it’s well worth spending an afternoon in the ever popular tourist spot. 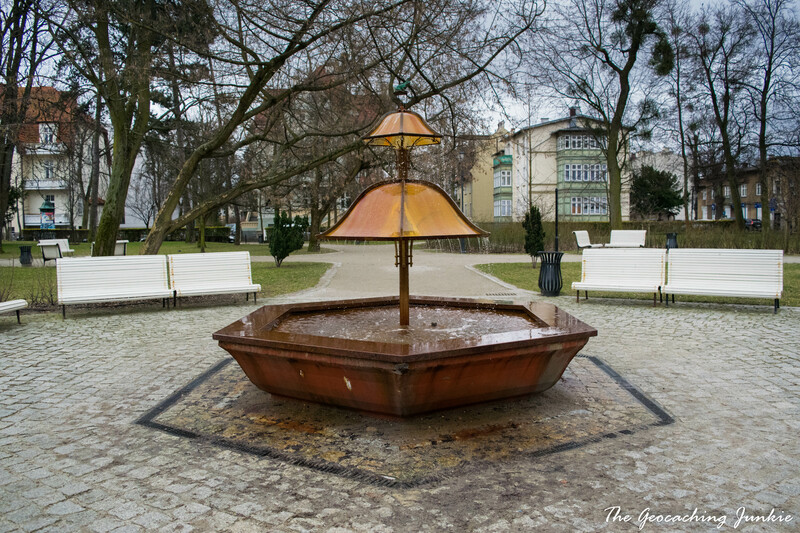 Our first stop upon arrival was the so-called ‘Inhalation Mushroom’, a fountain located in Park Marii i Lecha Kaczyńskich. We were there to gather information for the EarthCache related to the spring water here, but we had to wait a while as locals came and went, circling the fountain, washing their hands and faces; one man even dipped his comb in the water before running it through his hair. The iodine-bromide spring water, which is sourced 800 metres underground, is believed to assist with various ailments such as rheumatism when the vapours are inhaled. 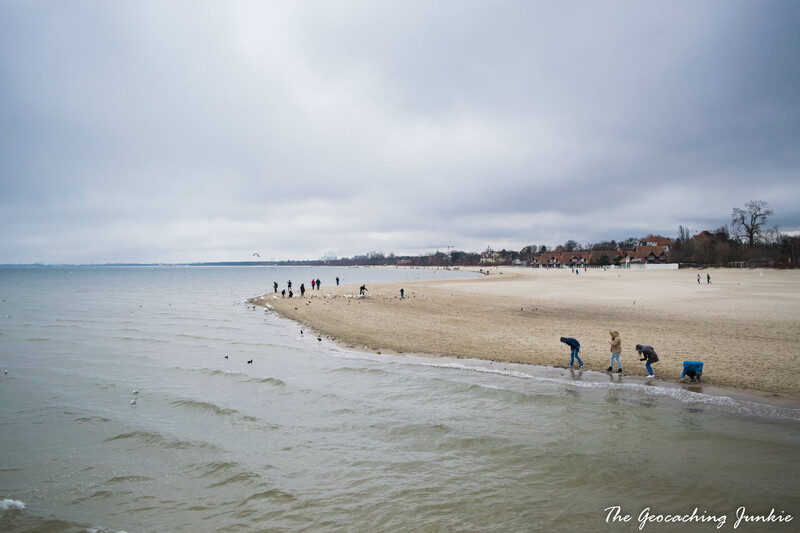 This healing water has been put to great use in Sopot’s spa hotels, where even on a cold March day we spied lots of guests milling in and out. 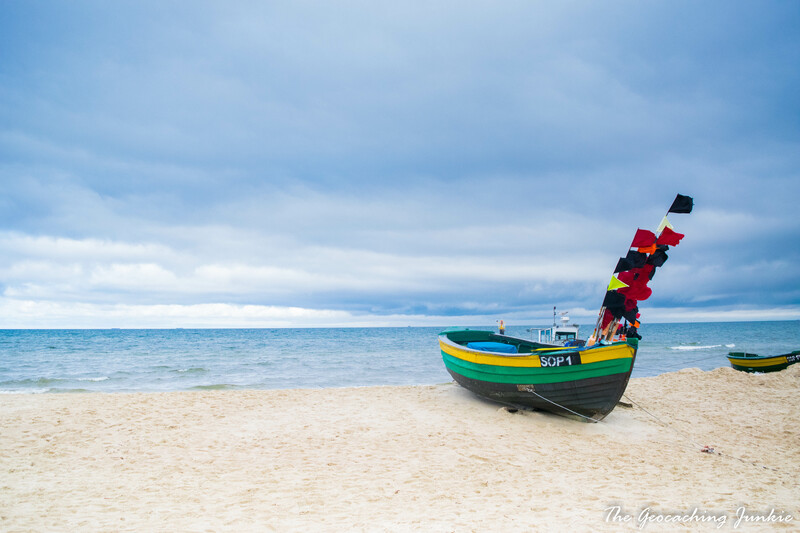 It’s not difficult to see why Sopot is such a popular tourist spot in the summer, when you catch a glimpse of the beautiful white sandy beach. I can imagine almost every section of the sand covered in sun loungers and beach towels when summer arrives. The bitter wind blowing in from the sea quickly taught me the origin of the phrase ‘it’s Baltic outside.’ We didn’t spend too long walking along the soft sand, although a bevy of swans didn’t seem to mind, and were enjoying a day by the seaside. There is a path parallel to the beach which has several geocaches dotted along it and we enjoyed walking it later in the afternoon, before circling back on a higher road parallel with the train line to find several more hides. 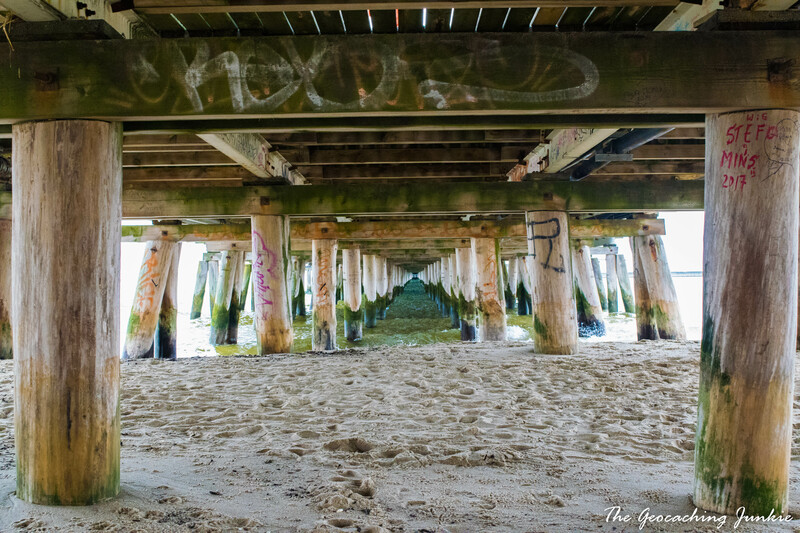 Perhaps Sopot’s most famous attraction is the 511.5 metre long pier – the longest wooden boardwalk in Europe. 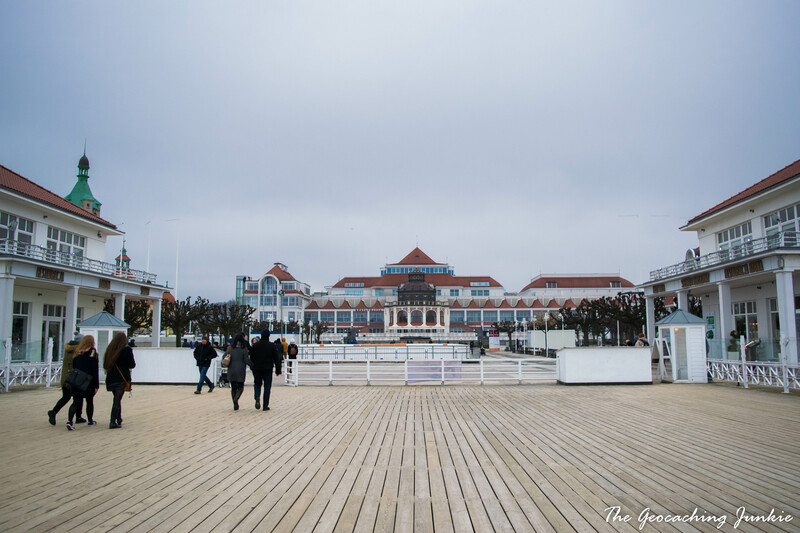 Despite the bitter cold, there were plenty of people walking the pier, and we rambled all the way out to the end, more than half a kilometre in to the Bay of Gdańsk. The pier was first constructed in 1827, with the current length dating from 1928, and it’s now a Grade I listed structure. 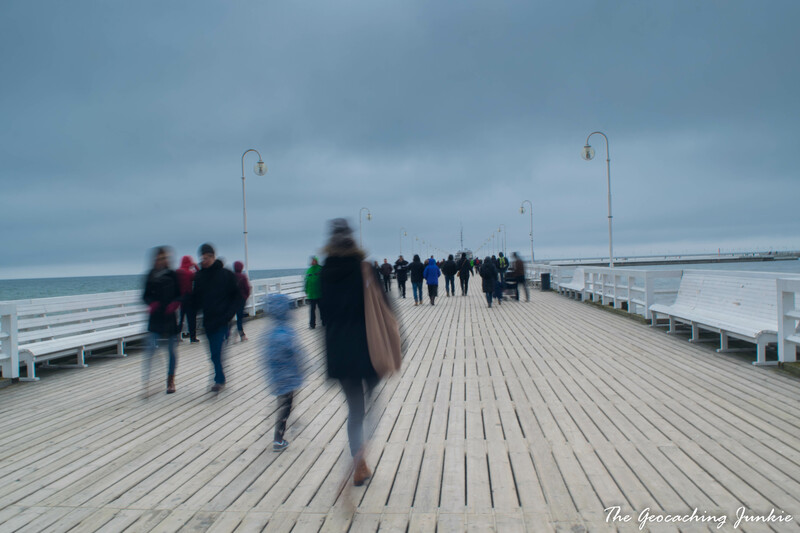 The walk to the furthest point of the pier is also believed to have healing properties, as the iodine levels are higher there than they are at the beach, and subsequently it has become known as a ‘health walk’. 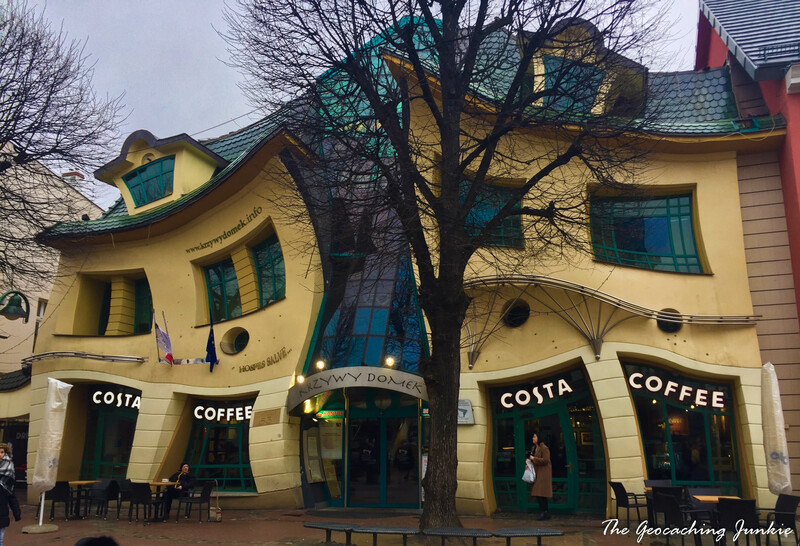 In contrast with Gdańsk, where Gothic and Renaissance architecture is king, one of the most photographed buildings in Sopot dates from just 2004: the so-called ‘Crooked House’. Krzywy Domek was designed by Szotyńscy & Zaleski, who were inspired by fairytale drawings from illustrators Jan Marcin Szancer and Per Dahlberg. 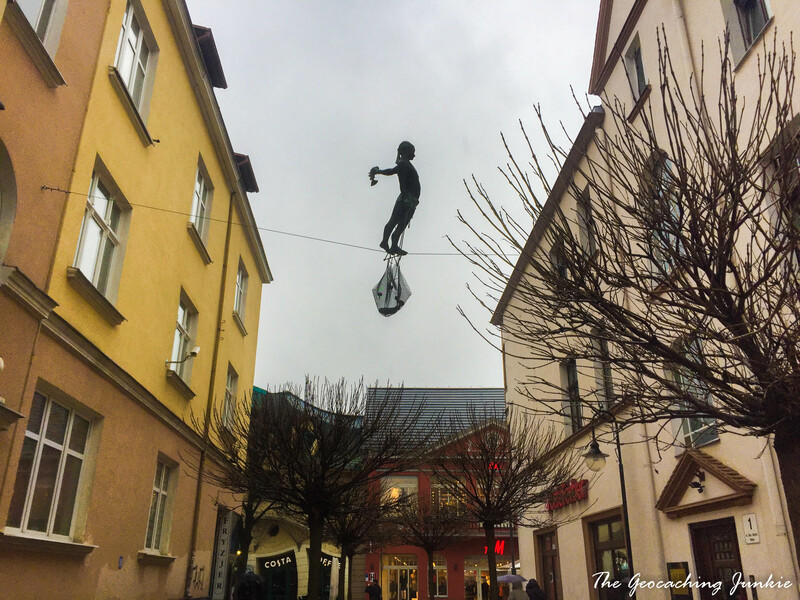 Opposite the crooked house, on Monte Cassino Street, is a fascinating sculpture of a fisherman holding a fish whilst balancing on a tightrope. 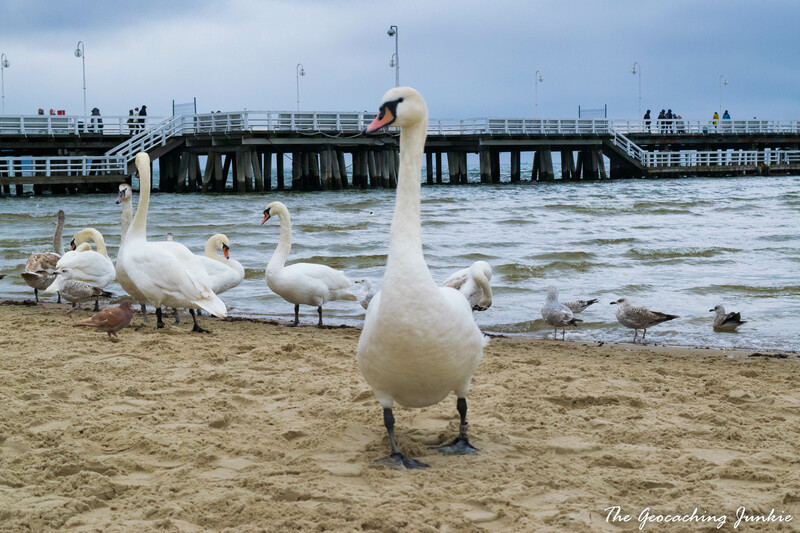 Sopot is a gorgeous little seaside town, and well worth the very cheap fare from Gdańsk for an afternoon, whether it be in summer for a quintessential ‘day at the beach’, or like we did in colder weather, to enjoy the sights before the throngs of tourists arrive. 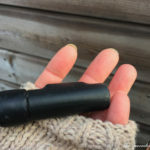 Have you gone geocaching near the beach? Where are your favourite beaches? Let me know in the comments!